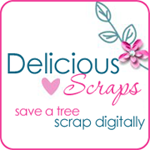 Delicious Scraps: New PTU CU - Spring Tags 2 and a FREEBIE!! New PTU CU - Spring Tags 2 and a FREEBIE!! This is a set of 6 Spring Tags for Commercial Use. You can get them at my store for only $1!! Made with designs by Trina Clark with her permission. Click on the banner to visit her store! Here is a freebie tag sampler! Anna these are Gorgeous! TYSM for sharing everything that you do, I love the new Fresh kit! Thank you for sharing your CREATIVE talents! :) have a BEAUTIFUL day!